While no federal department oversees kitty consumption, veterinary nutritionists specialize in structuring balanced diets for cats. "The best thing is probably a commercial food with a nutrition claim certified by the Association of American Feed Control Officials, or AAFCO,” says veterinary nutritionist Sally Perea, DVM. AAFCO sets standards and enforcement policies for regulating the manufacture, distribution and sale of animal feeds, including cat food. Below, with the help of Dr. Perea, we have gone beyond AAFCO statements to construct a four-group Feline Food Pyramid Guide to complement the popular USDA graphic. Animal protein also contains preformed Vitamin A, integral to growth as well as maintaining healthy skin and hair. While people and dogs can synthesize A from the beta-carotene in plant pigment, cats cannot. They rely completely on animal sources. "Carrots will not meet their vitamin requirement,” says Dr. Perea. Finally, in order to avoid heart and eye problems, cats need the amino acid taurine. Cats cannot synthesize taurine from other amino acid precursors. They have to get it straight from animal tissue. Taurine helps your feline to form what are called biliary salts, which are necessary for digestion of fats in your cat’s small intestine. Taurine also supports feline vision, heart function, the nervous system and reproduction. 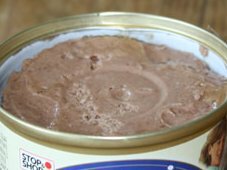 While animal protein is the mainstay of the feline food pyramid, your cat also needs animal fat to thrive. Indeed, fat fills the second-largest slot in the pyramid. "A mouse is almost half fat,” points out Dr. Perea, referring to a feline’s diet in the wild. Cats specifically need a fatty substance called arachidonic acid, an Omega-6 fatty acid essential for energy production. This acid is not found in vegetable oils, only in animal fat. Additionally, fish fat provides Omega-3 fatty acid, which may prevent a host of inflammatory conditions that could affect everything from your cat’s arteries to its urinary tract. While you don’t need to start feeding your cat green salads and fruit cups, you may want to seek out a cat food that contains them, or at least lists the antioxidant Vitamin E found in green leafy vegetables as well as apples, berries and mangos, to name a few. Vitamin E plays a role in the formation and maintenance of cells, and also in the metabolism of fats. Cats benefit from the nutrients in fruits and vegetables, if only in small amounts. 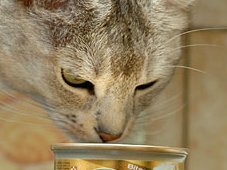 The USDA may not be offering nutritional advice for cats any time soon, but educated cat owners can nevertheless ensure that their four-legged friends get all the nutrients they need. 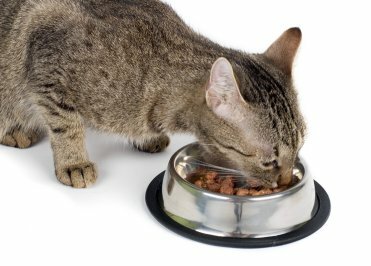 With the right proportions from the right food groups, your pet’s diet will satisfy the feline food pyramid guidelines while satisfying your feline’s hunger, too. Jun 29, 2017 admin Comments Off on Is Your Cat Diner Up to Code?